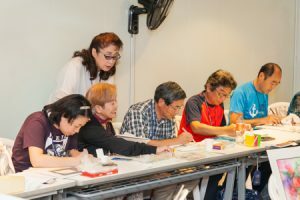 Watercolor painting classes are held regularly on the Ocean Dream. The instructor, Ms. Iwai goes around each table and helps each student. One of the many benefits of these culture school classes is that each person gets individual and personalized attention from the instructor. The students all look forward to going to class and spending time painting memories from their travels; a joy definitely unique to a trip around the world on a cruise ship. We are excited that everyone has a chance to reminisce on and record their travel memories in the form of art.